FREDERICK, Md. (September 2, 2018) - Following a 2-1 win in a suspended game on Sunday, the Myrtle Beach Pelicans fell 8-4 to the Frederick Keys on a walk-off grand slam from Nymeo Field at Harry Grove Stadium. Due to rain, Saturday's game was suspended after five scoreless innings. In the first game of the day, the Pelicans (61-77, 27-41) and Keys (64-72, 29-38) picked up in the top of the sixth inning. Bryan Hudson had thrown five shutout innings for the Pelicans with five strikeouts before the suspension. After the Keys scored a run on a Randolph Gassaway single in the bottom of the sixth, the Pelicans came back to take the lead. Yeiler Peguero singled home the game-tying run in the seventh and Luis Ayala hit into an RBI fielder's choice to give the Birds a 2-1 lead. Manuel Rondon (2-5) earned the win in his two innings of work for the Birds while Frederick's Tyler Erwin (4-4) was handed the loss. The Pelicans struck first in the second game of the day. Zach Davis rolled an RBI single up the middle in the second to score Wladimir Galindo , making it 1-0. The Keys tied the game in the bottom of the third when Cole Billingsley scored on a wild pitch. 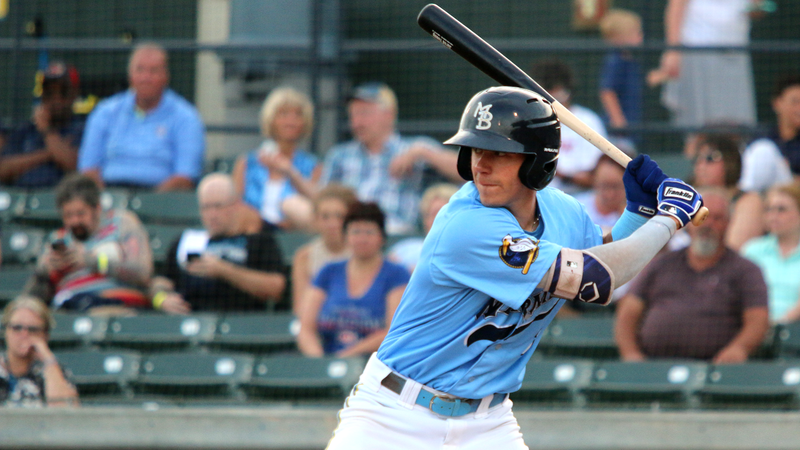 Frederick then took the lead in the bottom of the fifth inning when Chris Clare lined out to center for a sacrifice fly that scored Collin Woody. The lead did not last long, however. Jared Young knotted up the game again with a solo home run in the top of the sixth, his sixth blast of the season with the Birds. In the top of the ninth, the Pelicans nabbed the lead. Michael Cruz scored on an error and Davis stole home on the back end of a double steal. That gave the Birds a 4-2 advantage. The Keys tied the game in the bottom of the ninth inning when Billingsley smacked a two-run single up the middle. With the bases loaded in the bottom of the 10th inning, T.J. Nichting crushed a walk-off grand slam off of Yapson Gomez (1-2), giving the Keys a 8-4 win. Matt Trowbridge (5-2) earned the win for the Keys. The Pelicans and Keys conclude the 2018 campaign at 2 p.m. on Monday. Myrtle Beach will send RHP Tyson Miller (9-8, 3.63 ERA) to the mound against Frederick RHP Cristian Alvarado (11-11, 4.26 ERA). Coverage starts at 1:45 p.m. on MyrtleBeachPelicans.com/Broadcast, the MiLB First Pitch app and TuneIn.